PAPER: One of the things that used to drive me crazy was all of the scraps of paper. The bits and pieces that were left over from a project. You know the pieces that are too small for most things and yet too big to recycle. I tried several organizing systems, but this is by far the best. I basically created a bag for each of the main colours. The bags are ziplock type bags, but were not bought in a store. They were passed onto me and were originally the packaging for computer parts (I think). The bags are about 8 3/4″ wide by about 12″ tall and the plastic is actually a little heavier and thus more sturdy than the store bought bags. The size is perfect, but I am sure store bought bags would be fine as well. (I also wonder if clear page protectors might work as you can purchase some that are a bit thicker.) I punched a small hole in the corner of each bag and then set an eyelet in so that the plastic wouldn’t tear. I then tied a ribbon to each bag, indicating the colour of paper it would contain and lined my wall with those little screw in hooks. Each bag hangs on its own hook and all of my scrap paper is organized by colour. I still have to sort through the bag to find the exact shade I am looking for, but it is so much more manageable and the system is really easy to stick to. If you don’t have a room, you could always keep the bags/page protectors in a binder. Here is a close-up shot of the eyelet and ribbon tie on a bag. I now use my “Big Bite” tool from Crop-A-Dial for setting eyelets and hole punching. This tool is super handy. I used to use this “eyelet set” before I had my Big Bite. It works fine and could be used in lieu of the Big Bite tool. EMBELLISHMENTS: What do you do with all of the little knick-knacky items like brads, buttons, tape, eyelets, rhinestones, etc.? Well, what works for me is this screw/nail chest that I picked up at Canadian Tire for under $20. I think I got it for 60 or 70% off and it seems to do the trick. I don’t love the navy colour and could easily spray paint the cabinet, but thought I would wait until I actually have a colour pallet to work with and then paint it to coordinate with the other elements in the room. The little drawers work perfectly to hold all of the little odds and ends that I use to dress-up a page. RIBBON: I have quite a bit of ribbon and have not yet got the perfect system for organizing it. I have some of it in jars which works well, but I would need way to many jars to store all that I have. I have some in ziplock bags, similar to the paper, but I don’t find this works very well and the balance is in a drawer. I think that if I had the space (or set-up) the jars would be ideal. You can easily see what you have at a glance and organize the jars according to colour. Maybe some day! You can see a few of the ribbon jars and the bags hanging on the bottom hook of the little white shelf. 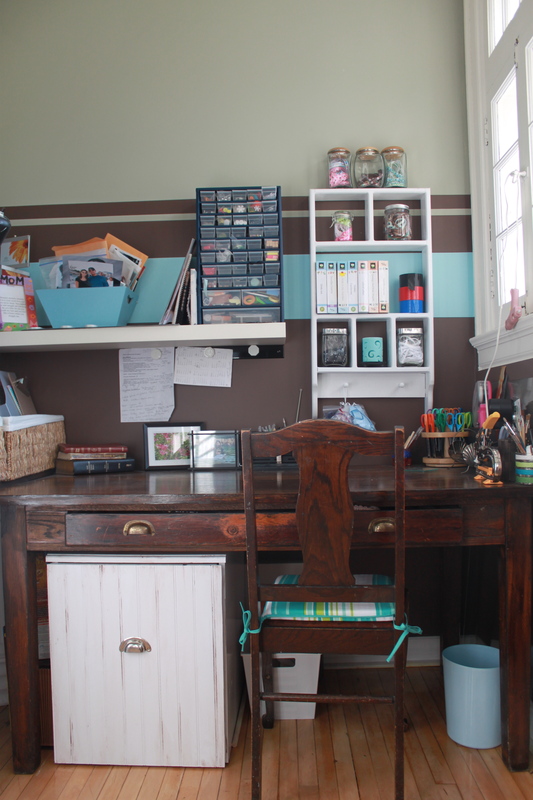 SECRETARY STYLE DESK: The white secretary style desk in this room was a cheap Kijiji find. You can check-out the before and after shots by following the link. 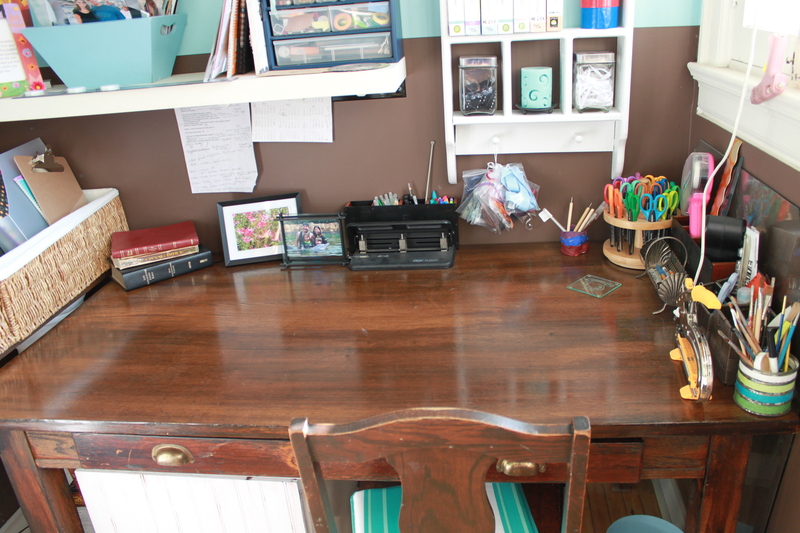 I love that this desk provides additional storage inside and an extra work surface when open. It works great for a small space because it can be closed-up when not in use. 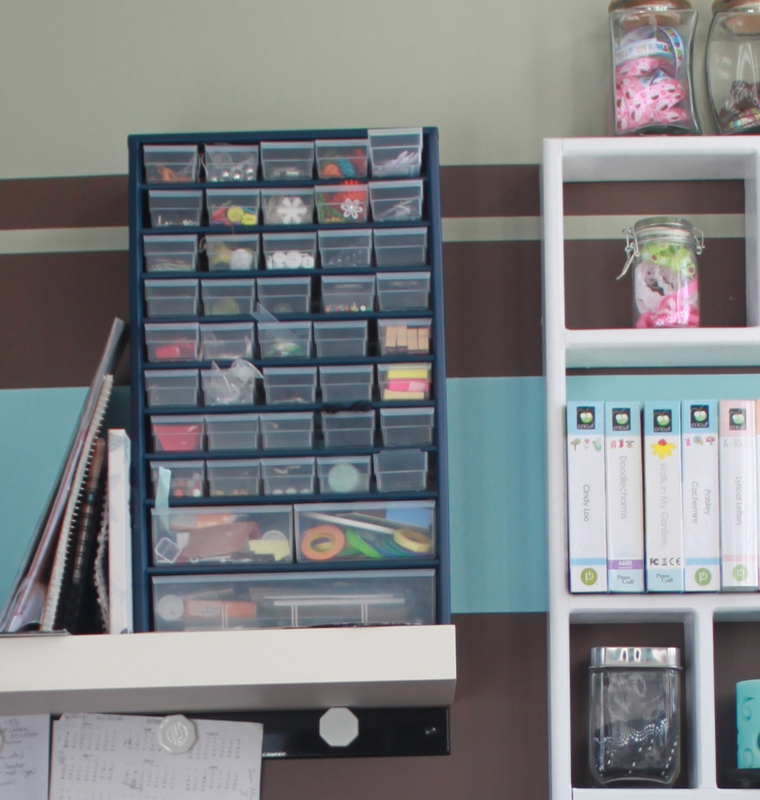 CRICUT DRAWER: I repurposed a drawer from an old desk and incorporated into my existing scrapbooking room because I loved this feature in my old desk. (Actually my new desk is older than my old desk which might be a bit confusing). This drawer allows me to tuck my Cricut away, without the hassle of having to haul it in and out every time I go to use it. The drawer feature allows me to keep it plugged in and ready to go at all times, but also allows me to put it away so that it is not in my way. Love this! The drawer is the big beadboard unit below the desk. Overall, this little space works really well and I know I am very fortunate to have it. I will continue to make this space all that it can be in both function and visual appeal. It is a work in progress, but it is all MINE and I love that!